Hope Hall would like to thank our partners at the University of Rochester’s Cognitive Neurophysiology Laboratory (CNL) for hosting a Brain Day event for Hope Hall students on Friday, April 27th, 2018. The U of R’s CNL wanted to share their interests and enthusiasm for the neurosciences with our elementary, middle, and high school students. As part of the U of R’s goals to foster strong connections with local communities, and the continued importance of drawing interest from America’s youths to the STEM fields (Science, Technology, Engineering, and Medicine), researchers have crafted educational exhibits meant to teach concepts of how the human brain works in ways that are accessible and, most importantly, fun! 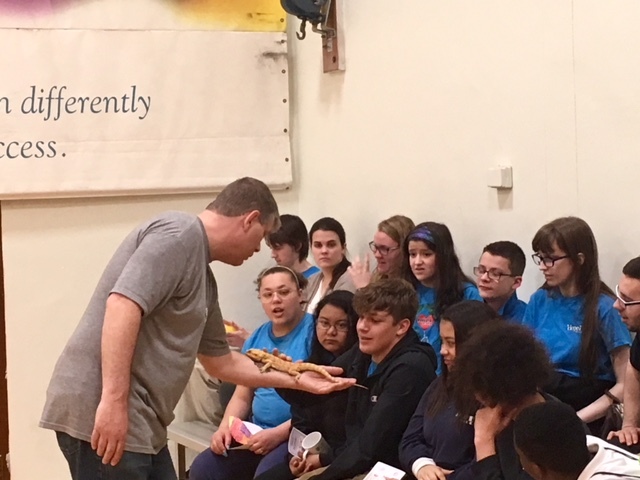 Expert brain scientists used clever interactive examples to show Hope Hall students how we see, hear, taste and smell the world around us, as well as guided art projects meant to teach how the brain is organized into interconnected compartments that serve specific functions. Hope Hall students were issued passports to track their progress through the educational exhibits, and earned cool brain prizes for completing the grand-tour! The CNL is an interdisciplinary research group at the University of Rochester which focuses on understanding how the human brain works, and what is going wrong when it doesn’t. Current studies at the CNL focus on a range of brain disorders, from Autism and Dyslexia in children, to declining mental performance with age. The CNL is also a data collection center for the ABCD study, funded by the NIH, and the largest study on brain development in history. Hope Hall is very excited to partner with the CNL to help our students excel in STEM learning!